Not every plant in the landscape needs to be glamorous. Sometimes you just want something that looks fine, performs its assigned function, doesn’t get pushy around other plants, isn’t needy, and doesn’t die. Welcome to Bearberry, a no-nonsense native shrub groundcover ideal for creating a low, lush, intricate dark green blanket in large, dry, sunny, spaces you’d like to fill in with something that isn’t going to drive you nuts. Mature height ranges from six inches to twelve. Plants will tolerate light shade. 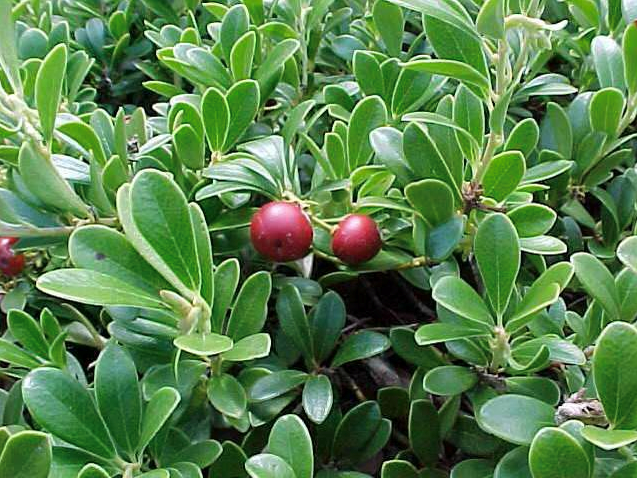 Bearberry thrives in sandy soils as well as cruddy, infertile soils where the only thing you’ve been able to grow so far is weeds. It prefers acidic soils but as long as the soil drains you should be fine. You don’t even want to fertilize this plant. Water it moderately every 3-4 days after planting, taper it off to once a week after the first month, and for the seasons to follow, pretty much let it fend for itself, unless encountering severe drought. At a moderate pace each plant will grow outward to a spread of around five feet, perhaps six depending on length of growing season. Clusters of small, pink-white, bell-shaped flowers emerge within the top layer of foliage in spring, small but pretty. What’s more attractive are the showy, shiny, brownish-red berries that emerge in late summer into fall. The birds love them. It’s perhaps most attractive in mid fall to winter, when the rich green leaves turn a lovely bronze. ‘Massachusetts’ is a disease resistant selection with slightly smaller leaves than the true native parent. All Bearberries are evergreen, meaning they retain their leaves even in winter, similar to Boxwood. Use as a broad groundcover in open areas or in part sun to form the verdant floor around trees and shrubs. Looks great with stone outcroppings and as the front-row starting point when layering various heights of trees and shrubs. Hardy to zone 3 with a growing range of zones 3-6.